But Dame Enid's biographer, Diane Langmore, disputed this romantic version of events, and stated that the couple are more likely to have met at the Needham's home where John had been invited for afternoon tea. Curtin became a frequent visitor to the Needham home during the month he spent in Hobart. When they met, Elsie was 21 and John was 27 years of age; their courtship would last for five years. Many difficulties beset any prospect of developing a lasting relationship. As a strict Methodist, Elsie had signed the pledge and neither drank nor danced; Curtin was a heavy drinker who within three years would be hospitalised for alcoholism, and dancing was one of his favourite pastimes. 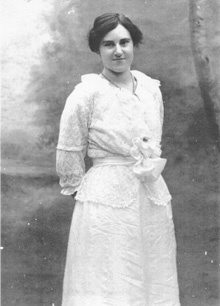 Elsie Needham aged 22 1/2, Melbourne, March 1913. He omitted to say how he paid for board and lodging during that time, as the morals of the day prevented him from staying at the Needhams', but much of their time was spent 'sitting under a tree', presumably talking. Over the next two years, Elsie and John corresponded irregularly, but within a year, he was addressing letters to 'Elsie Dear' 22. He visited Hobart again in March 1913, and they went out to 'a couple of shows together'. Nevertheless, by the winter of 1914, when Elsie came to Melbourne to board a steamer for South Africa where she planned an extended stay with her brother Leslie, most of their courtship had been by letter. Elsie returned to Melbourne in November 1915 aboard a one-class boat the Commonwealth, where she met the socialists Vance and Nettie Palmer, who were returning from Britain. Elsie loaned one of her books, titled The Pit or Octopus, to a fellow passenger, Albert Rowe, who failed to return it.